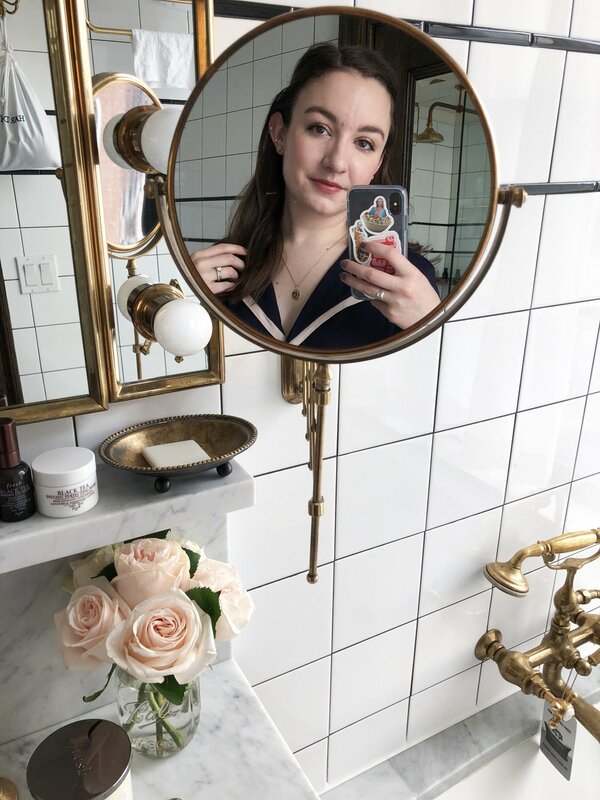 Lately in my quest for quick and effortless makeup, I've been using the same lip product on my eyes, lips, and cheeks, hurriedly smearing it on with my fingers before running out the door. I was really inspired by the Bite Beauty Multisticks (review), which I'm still loving, but since those are actually designed to be used on the eyes I didn't want to be redundant. I do want to put a little disclaimer in saying that most lip products are not tested for their safety on the eyes, so do proceed with caution. Don't say I didn't warn ya. The shades I tend to reach for with this techniques are the more brown tones - they work everywhere. I first tried using the Glossier Generation G in Leo on my eyes after Amelia suggested it, and it's such a beautiful hint of color. The new more moisturizing formula lends itself well to the eyelids actually, making it super easy to blend. The other sheer brown (that I also happened to mention in my Everyday Brown Lip post along with Leo) is the Laura Mercier Creme Smooth Lip Colour in Milky Way. It's a nice cooler-toned alternative to Leo. For a bit more pigment, I've been going for the NARS Satin Lip Pencils in Bansar and Het Loo. Bansar is a rosy brown, while Het Loo is a warm brick-red brown. They both make good bases for more eyeshadows or look great on their own. I especially like topping Het Loo with Extra Bitter from the Urban Decay Naked Ultimate Basics Palette. Again, because of the creamier formula, they're really easy to blend onto the lids with a finger. I also have been loving soft pink shades - I promise they won't make it look like you have pink eye. For just a hint of glossiness and sparkle, you can't go wrong with the Chanel Rouge Coco Shine Lipstick in Boy. It's a classic for a reason, and it actually looks just as pretty on the eyes as it does on the lips. And the BareMinerals GenNude Radiant Lipstick in Strip makes a perfect "no-eyeshadow" eyeshadow color with its rosy beige tone. Because these are all quite creamy, they do tend to crease, but I'm kind of into that look lately. I like that it looks a little grungy and worn in - it makes it look even more effortless. I think I've probably just been reading too much Into The Gloss. Have you tried using products in the "wrong" places before?